Ben Cohen and Jerry Greenfield continue to impress: They’re working on a collaborative beer, pondering pot-infused ice cream, and now, taking on a noble cause to bring awareness to climate change. 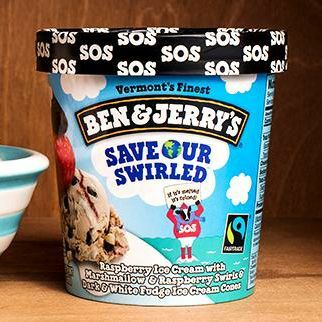 The newest Ben & Jerry’s flavor, called Save Our Swirled, represents a partnership with environmental advocacy group Avaaz and Tesla Motors. On each carton, there’s information about an online petition to push leaders to curb global warming, ahead of the upcoming climate-change summit in Paris. How does the flavor taste, though? Raspberry ice cream is mixed with marshmallow, raspberry swirls, and mini dark- and white-fudge ice-cream cones. As the ice cream melts, apparently, the tiny cones appear to drown. The tagline — “If it’s melted, it’s ruined” — is spot-on, of course.